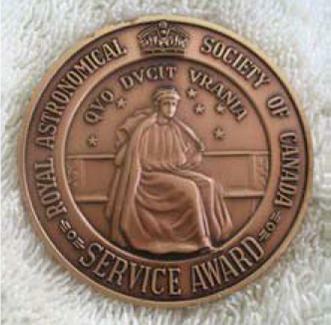 The Service Award is a major award of the Society given to a member in recognition of outstanding service, rendered over an extended period of time, where such service has had a major impact on the work of the Society and/or of a Centre of the Society. The Award is given only by resolution of the Board of Directors, on recommendation of the Awards Committee. The Award shall be presented at the Society's General Assembly. The recipient will be offered reimbursement for two nights' accommodation and up to two banquet tickets, if he or she travels to the GA to receive the award. Be a member in good standing (a Service Award may be made posthumously to a member who would otherwise have been eligible). Have rendered substantial service of a well-defined nature to the Society and/or a Centre over a period of at least ten years. Such service should have had a major, constructive impact and would involve a very substantial and continued commitment on the part of the nominee. Not have received a Service Award before. Any two Society members may submit nominations for the award. Nominations should be sent to the Awards Committee chair by December 31. Use the fillable form below. Note: A special Service Award was given to Col R.S. McLaughlin in 1965 in recognition of his munificence in funding and endowing the McLaughlin Planetarium in Toronto. Links to relevant JRASC pages are provided where available. Citations (PDF) are provided for those not published in JRASC.